Is there anything more versatile for a child's wardrobe than denim? With plenty of jeans in their closet or drawer, they'll always have something to wear. Kids' jeans pair perfectly with everything from their t-shirts and sneakers to polo shirts and loafers for a reliable look you can always count on for most occasions. Make it quick and easy for your growing boy or girl to get dressed by making jeans a primary staple in their arsenal of clothing. Jeans are durable and long-lasting, plus they are easy to clean in your washer and dryer, freeing up your time for other tasks. JCPenney has a wide selection of sizes and styles to suit your child's needs, including durable regular fit jeans and skinny fit jeans to cozy, comfortable jeggings. Let them run, jump, and play without worrying as much. Jeans are a popular option for hard-playing kids, withstanding rips and tears more effectively and giving rambunctious ones a little extra protection from scrapes and scratches. 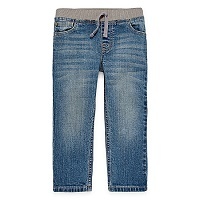 With comfortable jeans on hand, your child won't ever say they don't have anything to wear. This relaxed and casual choice will be their go-to grab when getting dressed. Outfit your boy in styles such as straight-leg, classic, skinny, and slim jeans, while your girl will feel fun and fashionable in skinny, straight, flare, boot cut, and jegging designs. Added touches such as cuffed hems, embroidered pockets, and distressing, as well as a variety of colors and washes, keep kids as stylish as everyone else in the family. 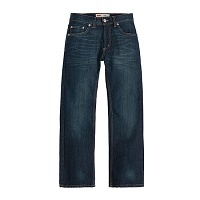 Many kids' jeans include additional features to enhance the fit, comfort, and durability of the design. Everything from jeans that are infused with stretch fabrics, moisture-wicking capabilities, or stain-releasing properties to elastic and adjustable waists, button flies, and break-resistant buttons all add to the jeans' fit and functionality. Keep your child comfortable and your clothes-cleaning tasks more manageable with these extra design options. Finding the right size for your toddler, child, or big kid is pretty simple at JCPenney. 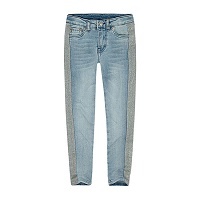 With sizes ranging from 2T to big kid 20 in slim, average, plus, and husky, locating the perfect fitting jean for both boys and girls is quick and easy with looks for every size and shape in the styles they want most. JCPenney carries the kids' jean brands you rely on for quality craftsmanship, long-lasting durability, and a comfortable fit. Brands such as Arizona, Levi's, Lee, Vgold, Okie Dokie, Dickies, and more offer a wide array of styles and designs built to withstand all your child's adventures and then some. Search online or in-store for the kids' jean styles and brands you want most at JCPenney, giving your growing child something to always wear. Jeans lend maximum versatility to any kids' wardrobe with a design built to last and one they will love to wear again and again, making your life easier.